With Breast Cancer Awareness Month in full swing, I celebrate the survivors and honor those lost. As my gal pals and I talk about how we all have been affected by this horrible disease, more stories are shared and one in particular left several of us very inspired. Although this is not a breast cancer story, it is still a true tale of another type of cancer that took a family by surprise and broke their hearts. What they did next is truly inspirational and reminds us to remember to laugh, to smile, to cherish the years, the days and the moments with our loved ones. 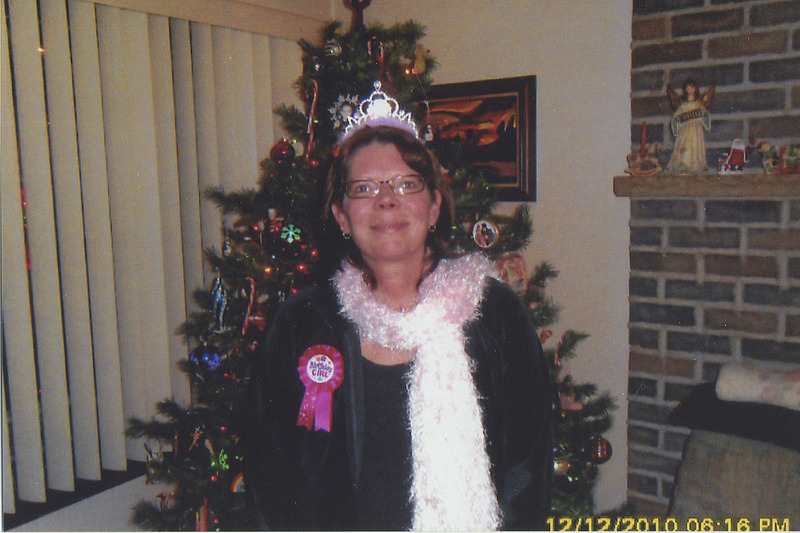 Read on to see how one beautiful woman’s memory lives on through a simple tiara, boa and birthday badge. And thank you to sisters Chris Stall and Terri Blay for sharing their special story and wonderful idea that the family has found to be quite healing. Mom hadn’t been feeling well for awhile. 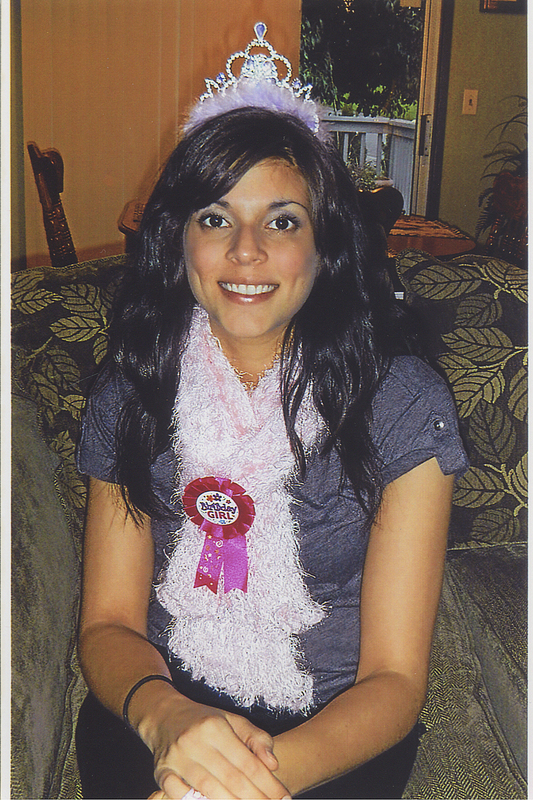 Tests showed a “mass” behind her adrenal gland and an obstruction in her esophagus. She was finding it difficult to swallow solid food. On Aug. 3, 2011, we took her to have an endoscopy. It was the worst day of our lives. Her esophagus was almost totally obstructed by a tumor and we were told that she had cancer. Within a week, we took her to the E.R. and she was very weak from not eating for three weeks. She was sent to another hospital where a feeding tube was placed into her stomach. Then she was sent home and was scheduled to have radiation and chemo. Her tumor was 21cm (8in.) long and was the largest the surgical oncologist had ever seen. We became her caregivers. We took care of her feeding tube, administered her meds and more. It was a very scary time for the three of us. We couldn’t help but ask why did our Mom get this? What was the prognosis? My mother lovingly nicknamed us Nurse Ratched 1 and Nurse Ratched 2, keeping her wonderful sense of humor in tact. And we decided that no matter what, Mom was staying in her home for the time she had left. Thus began a very emotional journey for us three Moser women. First and foremost, we kept her comfortable and the best way to do that was with LOTS of humor! She took chemo for one week, but she was already so weak from not having any nutrition for so long, that she was miserable. We told her that it was her decision whether or not to continue treatment. She decided to decline the chemo and radiation. A month after her diagnosis, I discussed hospice with Mom. We could never get ANY doctor to give us a straight answer and tell us her prognosis. Hospice was a lifesaver for all three of us. The compassion, support and excellent care was exactly what we needed. As Mom’s health was getting worse, we discussed her goals and that included visits with family and friends. 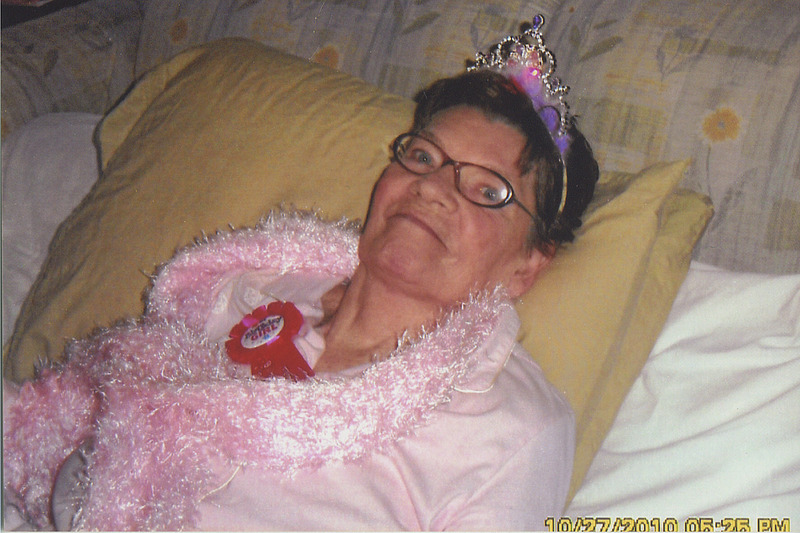 Her 75th birthday was Oct. 27, 2010. As usual for birthdays in our family, we always make it special for them in some way. 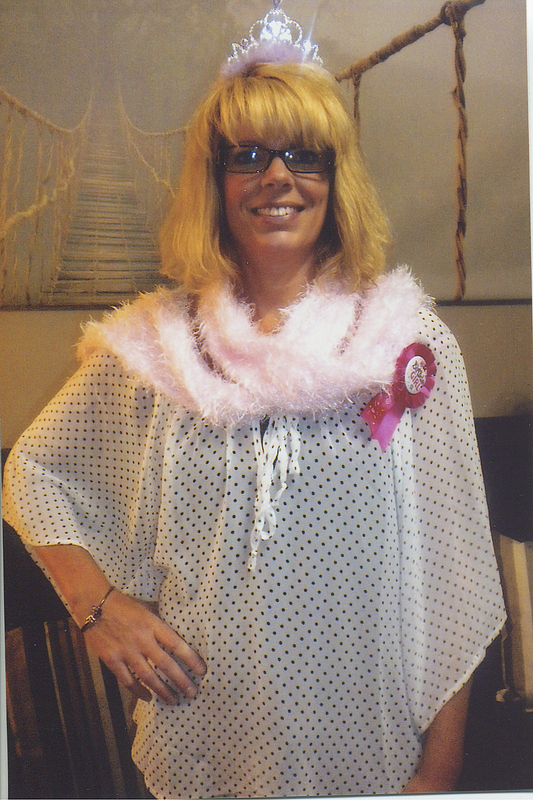 For Mom, we got her a tiara, boa, and a birthday badge that was decorated with balloons and banners. We made her a Dr. Pepper popsicle, since she couldn’t eat cake. Her friends gave her some new pj’s and she put them right on. Sis styled her hair and put lipstick on Mom, which she always wore. 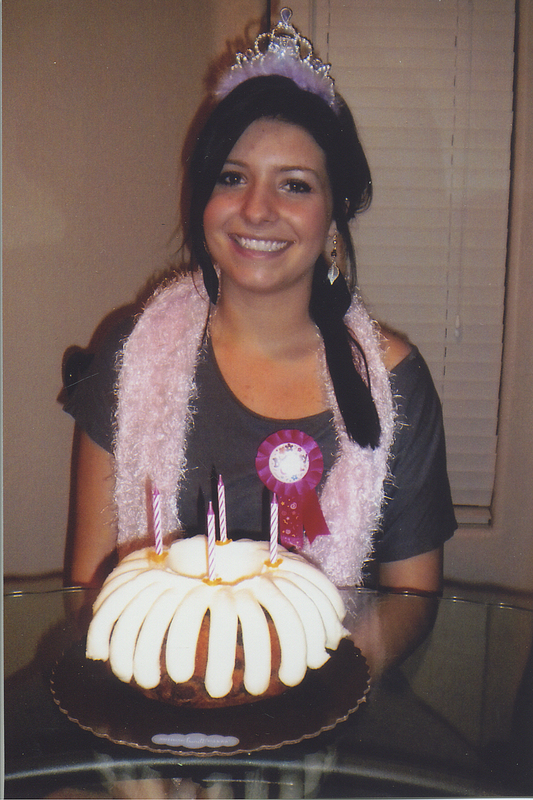 We made her feel so special, as we knew it would be her last birthday, and sadly we knew it was her last milestone. Mom died nine days later. Her birthday ‘stuff’ was still up in the living room. The next day as sis and I were looking at it, I told my sister that I was planning to wear Mom’s “regalia” on my birthday, which was coming up soon. Then I planned to pass it on to the next niece, sister, sister-in-law and on down the birthday line. We would take a picture of ourselves, write something down, put it all in a package and then mail to the next birthday girl! And Mom in her ‘regalia” was the very first picture in the photo book. We both knew that Mom would have LOVED the idea!! My cousin gave us a sweet little book that was purchased from a Christian book store to house the pictures. This little book also contains notes about Mom’s childhood memories, her favorite items, her first love and more. Having this book to add our pictures to and pass around has been very healing for our family. My Mom, Arlene, on her 75th birthday and the crown, boa and birthday badge that our family shares on our birthdays to honor Mom. Chris celebrating her Mother's life by wearing the royal accessories on her birthday. Terri's turn to celebrate her birthday and Mother's life in Mom's regalia! Madison turns 18 looking beautiful in Mom's pink birthday regalia! 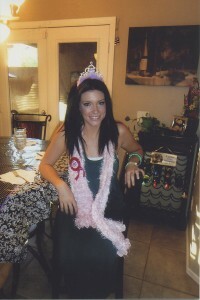 And Hayley celebrates the big 21st bday looking lovely in Mom's regalia! Taking care of Mom for three months was very hard and very sad, but that experience has been the most rewarding and the absolute best thing that Nurse Ratched 1 and Nurse Ratched 2 did….and will ever do. We were so very fortunate that we were able to keep Mom in her home during her illness and passing. And we gave her all the love and care that she gave us all of our lives. Not many people get that last chance to say goodbye. So Godspeed mama-san!!!!! Our Arlene Moser 10/27/1935-11/05/2010. Managedmoms.com wants to thank Chris and Terri for sharing this inspiritional story of love. Our loved ones truly live on in us. Rachel you did a great job on our story we loved it. Tomorrow would have been mom’s 76th birthday. Chris – Thank you for sharing your story with us. A lot of our managedmoms.com readers were very touched and you can see what a special person your Mom was and still is through you, Chris. You can tell that you are a wonderful daughter, wife, mom, sister and friend. And that is what life is truly all about. I’m sending prayers your way as you endure tomorrow. My late brother’s birthdays and anniversary of his passing are always hard for our family, but we also remember to celebrate what a wonderful life we had in our lives. Your tiara regalia does just that, Chris. What a beautiful way to rememeber and honor your lovely Mother.